NEW: Obama says "what we do in politics is not a reality show"
Washington (CNN) -- The White House released copies of President Barack Obama's original long-form birth certificate Wednesday, seeking to put an end to persistent rumors that he was not born in the United States. 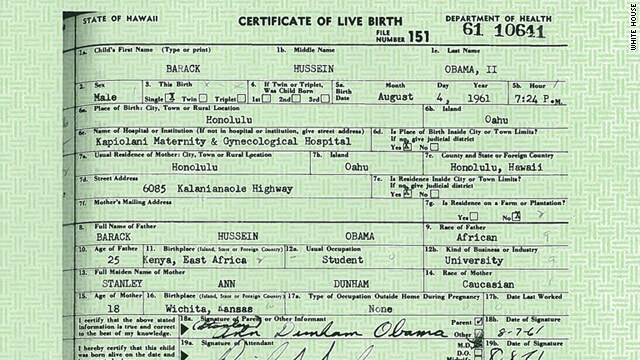 The certificate states, as Obama's advisers have repeatedly said, that the president was born at Honolulu's Kapiolani Hospital on August 4, 1961. Doubters insist Obama was born overseas -- possibly in his father's home country of Kenya -- and may be constitutionally ineligible to serve as president. "We do not have time for this kind of silliness," Obama told reporters at the White House. "I've been puzzled at the degree to which this (story) just kept on going." "Normally I would not comment on something like this," the president said. But the country has "some enormous challenges out there" that it will not be able to effectively meet "if we're distracted." "We're not going to be able to (meet those challenges) if we spend time vilifying each other," he stressed. "We're not going to be able to do it if we just make stuff up and pretend that facts are not facts. We're not going to be able to solve our problems if we get distracted by sideshows and carnival barkers." Obama released a shorter, legally binding "certification of live birth" in 2008, but failed to persuade members of the "birther" movement. The administration had to make a special request from the state of Hawaii to get the long-form certificate released, White House legal counsel Bob Bauer said. Typically, the state only releases the shorter, computer-generated live birth certification when people request such documentation. CNN investigation: Obama born in U.S.
Obama's personal attorney, Judith Corley, picked up certified copies of the long-form document in Hawaii and brought them back to the White House Tuesday evening, Bauer noted. While the president has tried to make light of the controversy, the question has remained political red meat for some of his critics. A recent CNN/Opinion Research Corp. poll showed that nearly 75% of Americans believe Obama was definitely or probably born in the United States. More than four in 10 Republicans, however, believe he probably or definitely was not born in America. The U.S. Constitution says only "natural born" citizens can become president -- a vague clause that followers of the birther movement contend disqualifies Obama from the presidency, since they believe he was born overseas. "The president believed the distraction over his birth certificate wasn't good for the country," White House Communications Director Dan Pfeiffer said. "It may have been good politics and good (television), but it was bad for the American people and distracting from the many challenges we face as a country. "At a time of great consequence for this country -- when we should be debating how we win the future, reduce our deficit, deal with high gas prices, and bring stability to the Middle East, Washington, D.C., was once again distracted by a fake issue," Pfeiffer said. "The president's hope is that with this step, we can move on to debating the bigger issues that matter to the American people and the future of the country." Pfeiffer told reporters that the birther debate has been politically damaging to the Republican Party. Regardless, the issue remains potent in GOP circles. Potential Republican presidential candidate Donald Trump recently seized on the issue, saying he had doubts about the president's background. Following the White House's release of the long-form certificate, Trump told reporters in New Hampshire that he is "very proud" of himself for helping to bring about the release of the document. "I've accomplished something nobody else was able to accomplish," Trump said. "I'd want to look at (the birth certificate), but I hope it's true so that we can get on to much more important matters." Obama "should have (released the certificate) a long, long time ago," he said. Trump, a billionaire business tycoon and reality television star, blamed the media for repeatedly bringing up the issue. Trump, however, has frequently raised questions about Obama's birthplace during his climb in recent GOP primary polls. What's your take on the birth certificate release? Allegations that Obama was not born in the United States have been repeatedly discredited. A recent CNN investigation turned up no evidence to support the birther claims. "This has long been a settled issue," said Michael Steel, a spokesman for House Speaker John Boehner, R-Ohio. The president acknowledged Wednesday that the release of the long-form certificate won't satisfy a "segment of people for which, no matter what we put out, this issue will not be put to rest." "But I'm speaking to the vast majority of the American people, as well as to the press," he said. "We've got better stuff to do." Later Wednesday, Obama told a New York fundraising event that "part of what happened this morning was me trying to remind the press and trying to remind both parties that what we do in politics is not a reality show. ... It's serious."